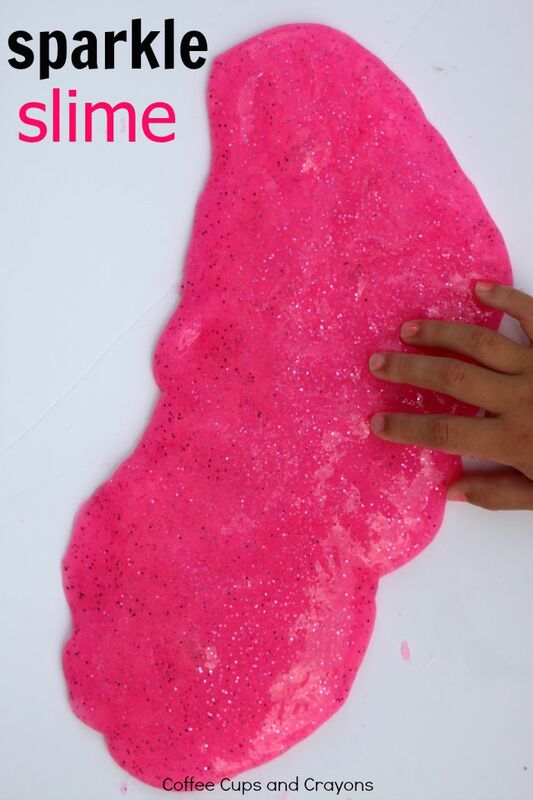 Have you made slime yet? 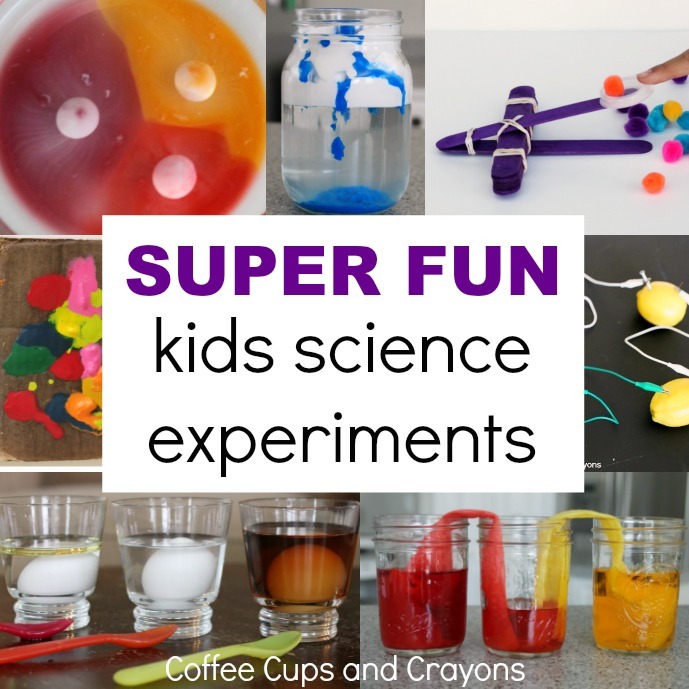 It’s a science experiment and sensory activity rolled into one! My kids love to help make it and I find that it’s the perfect activity for after school or quiet time. 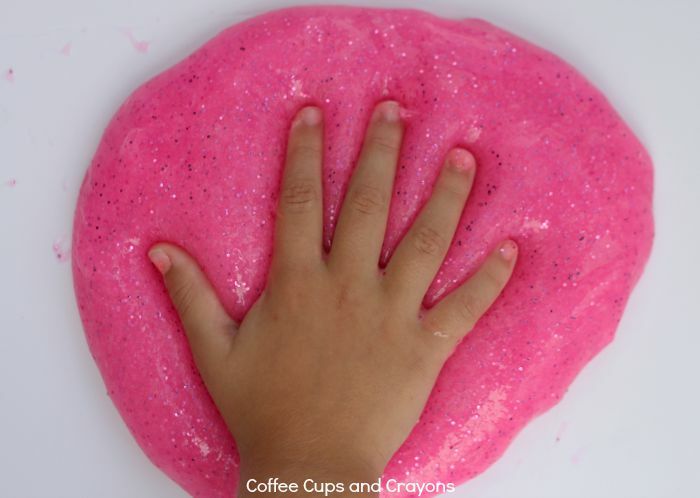 This sparkle slime recipe glitters and shines so is fun addition to pretend play or small worlds. Sensory activities or sensory play are just things that stimulate all of the senses and help kids’ brains learn about their world. Exploring different properties of matter by playing with slime can be an amazing lesson for kids that actually helps them begin to problem solve and think critically. Plus it’s a great way to unwind and decompress after a busy day! Pour both bottles of clear glue to a bowl or container. Next add the glitter. Let the kids add as much as they want–it will be stuck in there and not all over your house or classroom. 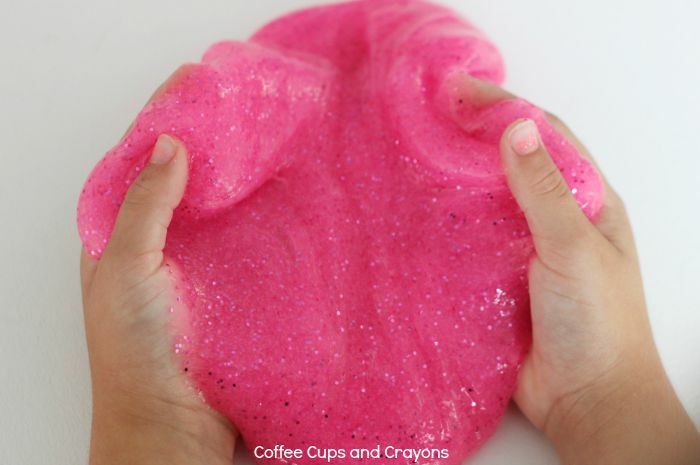 Sparkle slime is a great way for non-glitter lovers to use it without the mess. Then add the liquid watercolor. Choose any color you want and tint it to your liking. Black sparkle slime would be really cool so if the kiddos go crazy with multiple colors there it’s okay. Experimenting with the ingredients is STEAM learning at its best! Once you are satisfied with the color and the sparkle factor you can add the liquid starch. Use a wooden spoon to mix it all together. It will start to congeal and form a polymer. At that point you can keep stirring or start kneading it with your hands. The more you knead it the less sticky it will be. If you aren’t quite satisfied with the texture you can adjust now–more glue will make it stickier and more liquid starch will make it firmer. Then get ready to play and explore! Start by letting kids feel and squish and mold it. Then you can add in plastic toys, cookie cutters or even scissor for cutting. The only thing I would caution you on are toys with hair like ponies or dolls. The slime can stick to their hair and be hard to get out. If that happens using vinegar can break the polymer chains and help get it out. LEGO bricks or minifigures or small plastic toys are the easiest to add in and require no extra cleaning. 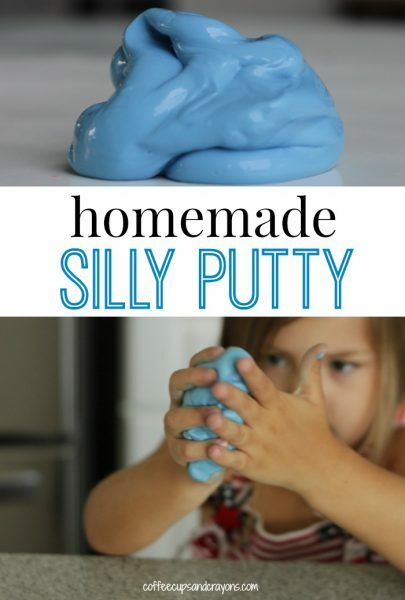 If your kids love slime then they will also adore making homemade silly putty!